Field hockey is in dire need of support in a country, which is passionate about the sport’s richer stepsister, played on ice. 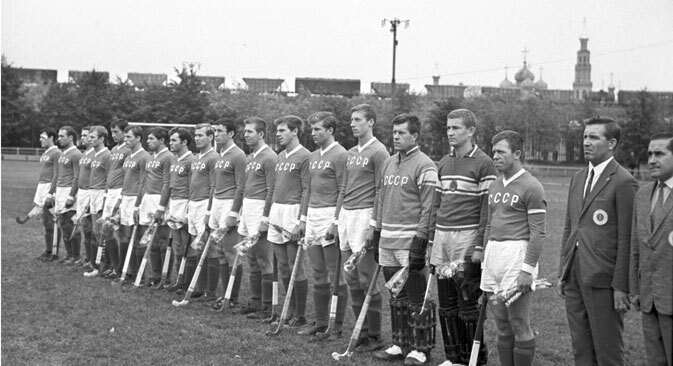 At one time, the Soviet Union managed to produce some highly competitive field hockey squads. Back in the days when the Soviet football team used to regularly hammer their hapless Indian counterparts, there was a joke among sporting circles that India would exact revenge on the hockey pitch. Although the Russians were giants in ice hockey, winning 7 gold medals in the Olympics (8, if you count 1992 when the athletes played as the Unified Team), field hockey is a sport where the country was never able to reach such heights. Yet, the Soviet team made rapid strides to go as far as the World Cup semifinal in London in 1986. The Russians made a late entry into the world of field hockey. The All Union Bandy and Field Hockey Federation of the USSR was established in 1967. “Given the state support and encouragement for all sports, people took to field hockey very well,” says Tomar van den Hengel, a Dutch writer who is working on a book about the development of field hockey in Europe. “They had a competitive side in the 1980 Summer Olympics but the bronze will always be tarnished with the fact that there was a boycott from several top teams,” she adds. Winning the bronze at the Moscow Olympics was a huge boost for the Soviet team, which qualified for the 1982 World Cup in Bombay and finished in 6th place. The names from those teams are all but forgotten in a country that has been spoilt for success in the international sports arena. The USSR took part in two more World Cups, losing to eventual champions Australia in the semi finals in 1986. The last hurrah came at the 1990 edition of the World Cup in Lahore when the USSR ended up in sixth place. “The greatest moments for field hockey in this country came in 1986 in London,” van den Hengel says. “That team beat Pakistan, England and Argentina, but ran out of gas in the semi finals when they were overwhelmed by the Australians.” She rues the fact that there is very little information about the team that achieved so much against such odds in the days of Perestroika. A sport that held much promise was one more casualty of the demise of the Soviet Union. From being a top six side in the sport, Russia now has a global ranking of 19, which is even below minnows- Japan, Ireland and France. For some strange reason, officials from the Russian Hockey Federation were not willing to talk on the record for this article. “The problem is funding…Ice hockey gets 4000 times the amount that we get,” says a federation official who was not authorized to talk to the media. “We have the talent in this country but the high and mighty only indulge in ‘propaganda’ for other sports.” He insists that the average Russian has no clue that hockey is even played on grass! Taking this official up on a challenge, I picked ten random friends in different age groups who have some inclination for sports. Just one of them had heard of field hockey. Despite the glum outlook, Russia does have some basic infrastructure in place, and veterans who tasted success in the 1980s. The sport also has a small reach in different parts of the country. According to the website of the Russian Hockey Federation, there are affiliated clubs in Moscow, St Petersburg and 7 regions in the country. The federation also boasts of 8000 members and organises over 50 events for children, juniors and seniors. “Russia can produce a highly competitive team in a matter of years if it involves coaches from Europe, India and Australia,” van den Hengel says. “Just look at the way Belgium came out of nowhere and is now one of the most feared sides in the world.” The Belgians are now the fourth highest ranked team in the sport behind Australia, the Netherlands and Germany, all field hockey superpowers. “After getting knocked out of the Field Hockey World League qualifiers, Russia will not qualify for the Rio Olympics, but with a good strategy in place, 2020 could be realistic,” van den Hengel adds. The women’s team still has a chance to qualify for the 2016 Olympics in Rio de Janeiro. If they get as far as the semifinals of the FIH Hockey World League competition, which will be held in Argentina in December, they can make it to Rio. It would be a great achievement but the Russian women’s team is up against some of the giants of women’s hockey such as the Netherlands, Argentina and Great Britain. A great performance by the Russian women’s team may just be the spark needed by the country to once again become a force. Russian women brought about a tennis revolution from the late-1990s. Maybe they can follow suit in this sport that requires speed, stamina and a great degree of intelligence.